There are various types of Yoga poses available in the entire Yoga Style. But is not easy to say which one can be right for you. The majority of yoga styles can be based on the same types of yoga poses or asanas, still the experience of pose can be absolutely different than that of others. In this article we have outlined very concisely some of the important styles of yoga, beside the important features. We hope this will make it easy to understand for you to know where to start. The below described list starts with classical Hatha Yoga, then you can moves down from strenuous, flow style categories of yoga to make your yoga practice for more relaxing yoga styles, finish with strength yoga. In the entire yoga styles – Hatha Yoga is a common category which combines most of the yoga poses. It is one of the oldest category by which you can bring peace for your mind and body for the purpose of deeper spiritual practices. It combines with yoga postures (Asanas) and Breathing exercise (Pranayama). Hatha Yoga should be practiced on a lonely island, assuming nobody else would hear the practitioner. In Hatha Yoga Pradipika Swatmarama introduces his system as preparatory stage for physical purification that the body can practices for higher meditation. This yoga is based on asanas or postures and pranayama or breathing techniques. Traditional Hatha yoga is a holistic yogic way, including disciplines, postures or asana, purification procedures shatkriya, gestures or Mudra, breathing or pranayama and meditation. The Hatha yoga predominantly practiced in the west consists of mostly asanas understood as physical exercises. This yoga is also known as stress reducing practice. Hatha yoga is one of the two branches of yoga that focuses on the physical culture, the other one is being raja yoga. Both of these are commonly referred to sadanga yoga, which means, six anga or limbs. Likewise Hatha Yoga, Vinyasa yoga is also a general terms use to describe various yoga poses. It is importantly means movement synchronized with breathing and one of the powerful poses based on a rapid flow by way of Sun Salutations. Vinyasa in Sanskrit term sometimes employed in relation to a particular style(s) of Yoga. Vinyasa defined in many ways. Such as – The linking of movement of body with breath. A particular sequence of movement of breath-synchronization used to change between sustained poses. To set an intention for the purpose of personal yoga practice and take the necessary steps in reaching the objective. Many of us come to yoga for different reasons. Sometimes for gaining greater flexibility of body, strength, getting right tone of the body, physical healing from injury, reducing stress or just to gain a deeper understanding of life. The beauty about Yoga and its benefits are huge that anyone can benefit from it. Yoga is good to everyone; practicing yoga is good to everyone. 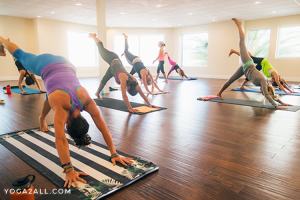 Ashtanga Yoga is a dynamic form of yoga, where breath and movement is connected, so that posture follows posture in a flow from start to finish. Vinyasa means coordination of movement with the breath. When to inhale and exhale and how to move from one posture to the next is well defined. Postures are done in a certain sequence. The primary series of Ashtanga Yoga is also called “Yoga Chikitsa”, which means yoga therapy. The purpose of this series is to strengthen, adjust, align and clean the body. The intermediate series “Nadi Shodana” strengthens and cleans the nervous system by opening and cleansing the energy channels of the body. Ashtanga Vinyasa Yoga affects both the physical and the mental levels of the body and mind. This yoga is used to describe a healthy, Vinyasa-Style Yoga. It is closed connected with Ashtanga Yoga and attempt to make Ashtanga Yoga more comfortable as well as accessible to students. Though, it sometimes differs on the set of series but rather allows the instructor freedom to teach what they wish. Bikram yoga is great for everyone, any age, size and shape, condition and or problem. To receive the benefits or Bikram Yoga one need to practice regularly, by and by you will feel the good effects of Bikram Yoga. Beginners are encouraged to do this yoga, but very slowly, at first need to start this yoga for few classes. Benefits happen right away for some, including normalizing your weight and it also helpful multitude of afflictions ranging from thyroid problems, weight loss, arthritis, back pain, stress, insomnia, diabetes, knee problems, kidney, heart disease, depression, control blood pressure and many more. The science of yoga was first formulated many thousands of years ago. Jivamukti yoga is a proprietary style or method of yoga which was invented by David Life and Sharon Gannon in the year of 1984. This is one of the best yoga pose in the entire yoga process, Jivmukti is a physical, ethical and spiritual practice, combining with vigorous Hatha yoga, with adherence to five central tenets, Sastra or scripture, bhakti or devotion, ahimsa or non-violence, nanda or music and dhyana or meditation. This is one of the famous yoga chosen yoga style of many celebrities. The postures of Jivanmukti or Jivamukti yoga induce stretching of the different parts of the body, which can tone your muscles and massage the internal organs of your body. This is the result in stimulating them and enhancing their performance, leading to a healthier life. Where breathing exercises help greater intake of oxygen to your lungs, and from there to the blood and blood circulation. Eliminate toxic waste is improved, thus helping to cure many diseases. B.K.S. Iyengar, named this yoga as ‘Iyengar Yoga’, this yoga is a form of Hatha Yoga that has an emphasis on detail, precision and alignment in the performance of posture or asana and breath control or pranayama. One can develop his or her strength, mobility and stability is gained through this asana. The yoga progress gradually by moving from simple poses to more complex ones and develop one’s mind, body and spirit step by step. Anusara Yoga is a powerful Yoga which comes under Hatha Yoga, which is a basic style of yoga. Anusara Yoga is fast becoming one of the most practiced forms of yoga in the earth. It works on the philosophy that all beings have an intrinsic goodness present in them. Anusara Yoga poses results in an increase in strength, toning of the muscles properly, and provides relaxation to the mind and body. This yoga is not only develops your physical strength, but also assists in making sure that you are at peace with your mind and body and your spiritual self as well. The concept of action in Anusara Yoga is related to Tantrik concept that explains the power of action, which is related with the natural flow of energy in your body and mind providing stability and freedom. Kundalini Yoga was influenced by the tantra and Shakti schools of Hinduism. The aim of this yoga is to focus on awaking Kundalini energy through regular practice of pranayama, meditation, mantra and asana. This is yoga of awareness. Practitioners of Kundalini yoga believe that it affects the physical as well as emotional and spiritual conditions. If you practice Kundalini regularly, you should see increased flexibility and possible improvements in functions of your digestive, nervous and cardiovascular systems. Through the poses, Kundalini is also thought to tone and strengthen your body. If you suffer from asthama or bronchitis and also practicing Kundalini yoga you can be benefited by practicing this yoga.